Updated for 2015, the latest Opticron Traveller BGA 10x32 delivers superior performance and handling in a super compact body weighing just 370g. Measuring just 98 x 118mm, each Traveller BGA fits easily into a coat pocket, backpack or sling bag making them perfect for the outdoor enthusiast preferring the capability of a full size binocular but wanting the portability of a compact one. Being one of the smallest and lightest binoculars available today is only half the story. The Traveller BGA Mg is designed and manufactured in Japan to offer a high quality viewing experience no matter which model you choose. Featuring BAK 4 prism units, PC phase correction and Oasis prism coating, image reproduction is refreshingly neutral with minimal edge distortion. The bodies are fully nitrogen gas waterproof to a depth of 3 metres, protected in a non-slip rubber covering for comfort and grip and feature wide wheel focusing positioned at the base of the body for superb balance in the hand. 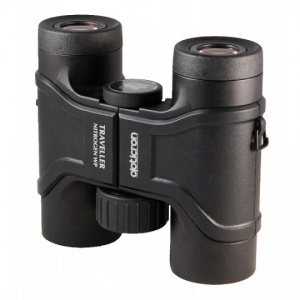 Traveller BGA binoculars benefit from a comprehensive 30 year guarantee and are supplied in a soft case with rainguard, padded lanyard and objective lens caps.